Below are descriptions with links of my work. My first article as an intern at The Leaven. I covered Catholic Schools Week from the angle of the New Evangelization, which schools are hoping to incorporate into curriculum. This story was not published in the paper Feb 6, 2015. 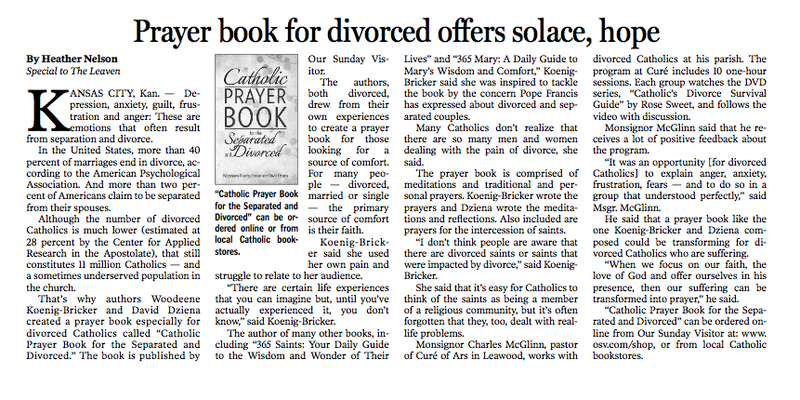 My second article discussed a new prayer book published specifically for those coping with divorce or separation. 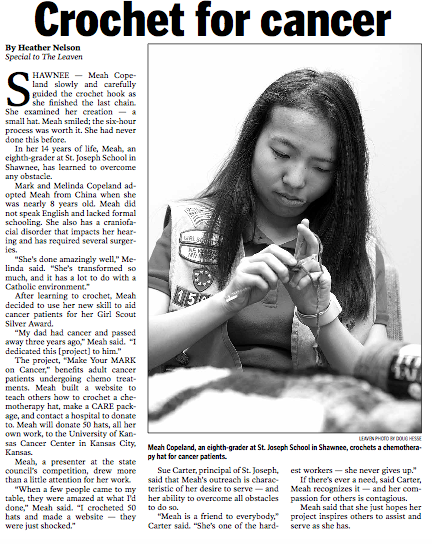 This story was published in the Feb. 27, 2015 publication of The Leaven. Click here to see online. 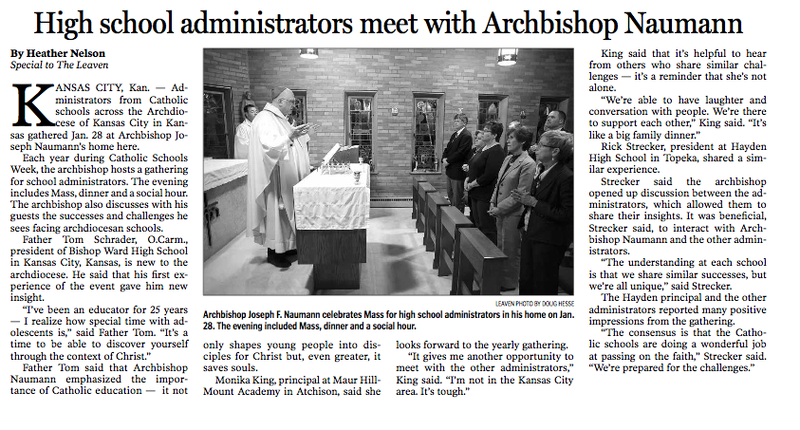 Also published in the Feb. 27, 2015 Leaven was a piece about Kansas City area high school administrators meeting with Archbishop Naumann. Click here to see online. I wrote a piece about a student-led retreat that is organized twice a year by student leaders at the University of Kansas. This story was not published in The Leaven March 6, 2015. 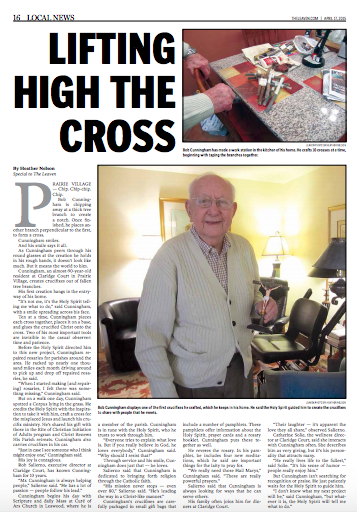 I wrote a feature story about an elderly man, who creates crucifixes out of branches he finds on walks. This story was published in the April 17, 2015 Leaven. Click here to see online. 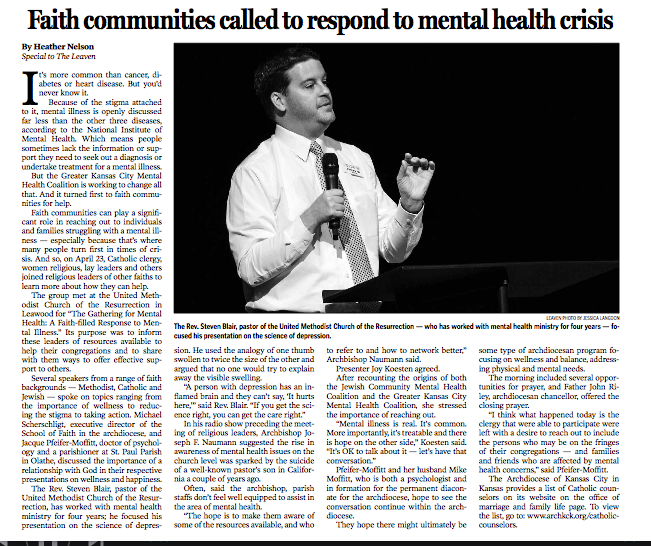 From the May 8, 2015 Leaven is an article about understanding mental health and learning to incorporate faith in the healing process. Click here to see online. I wrote an article discussing a young girl’s Girl Scout project that was influenced by her father’s death from cancer. This appeared in the May 15, 2015 Leaven. Click here to see online.